Once you receive your organ, you need to do everything possible to stay healthy and prevent rejection. While the risk of rejecting your new organ decreases as time goes on, it never goes away. Pill reminders like these can help you keep track of your medications. “Rejection” is a very scary word, but it doesn’t always mean you are losing your transplanted organ. Rejection is when the organ recipient’s immune system recognizes the donor organ as foreign and attempts to eliminate it. It often occurs when your immune system detects things like bacteria or a virus. Some degree of rejection occurs with every transplant, but how clinically significant the rejection depends on the individual. Your transplant team knows how to manage rejection with medication. Some complications may require re-hospitalization. Going back into the hospital allows you to be properly monitored and treated so that you can get healthy quickly. At least one episode of acute rejection is common within the first year after a transplant, but it can also occur years after a transplant. Despite the use of immunosuppression therapy, acute rejection can occur and often lead to chronic rejection. Chronic rejection, which is characterized by gradual loss of organ function, is an ongoing concern for transplant recipients because it can occur weeks, months or years after transplantation. Therefore, organ recipients should be aware of the signs of both acute and chronic rejection. Call your doctor as soon as you experience any of them. By weakening or reducing your immune system’s responses to foreign material, these drugs reduce your immune system’s ability to reject a transplanted organ. These drugs also allow you to maintain enough immunity to prevent overwhelming infection. Many of the medications used to achieve immunosuppression have adverse effects of their own. That’s why a combination of medications work best. These medications work in different phases of the immune response to minimize side effects and produce effective immunosuppression. Clinical immunosuppression usually occurs in three phases: induction, maintenance and anti-rejection. Transplant candidates often take many medications each day. Here are ways to make sure you know how to best manage your medications and their side effects as part of your daily life. If you feel overwhelmed, talk with your doctor and support groups to learn about what has helped other patients make post-transplant changes. Keep all medications out of childrens' reach. Always check with your transplant team before taking any new medicines, even the over-the-counter ones. If any medicine is soft, sticky, hard or cracked or has a notably different color or odor, ask your pharmacist to replace it with a new prescription. Always swallow capsules whole and never take them crushed, chewed or opened. Ask your pharmacist about which medications should never be taken with grapefruit juice. Keep a list of your medications with you at all times in case you are ever in an accident and are unconscious. Wear a bracelet or necklace that states you are a transplant patient and keep a list of all your medications and doses in your wallet or purse. Buy all of your medicines from the same pharmacy. Many pharmacies keep a medications profile for you to prevent causing harmful medication interactions. Get into a routine of taking your medications at the same time each day. Set up a time each week to sort out your medicines for the whole next week and put them into containers. Having family and friends help you sort your pills will make this job easier. 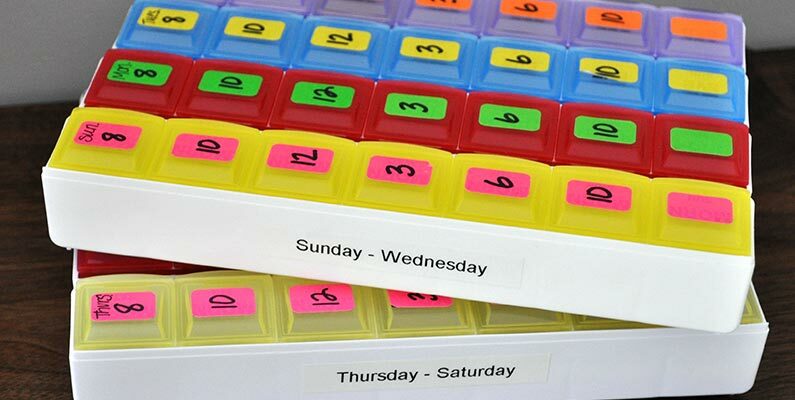 Use tools to help organize your medicines. For example, a pill box, small snack baggies labeled with days of the week and times of the day, an alarm clock or watch and/or charts may work for you. Because you should never run out of your medicine, even for one dose, it is important to keep track of how much you have. Mark your calendar so you remember to order your medications ahead of time. Keep your medications out of the sun and extreme heat. Always store your medications in a cool, dry place. Always take extra doses of your medications with you--not in your luggage--in case you get delayed or miss a plane or train, etc. Mail order pharmacies can ship your medicines to you when you are away from home. When traveling overseas and passing through customs, keep a letter from your doctor about your medications.